Hi all! 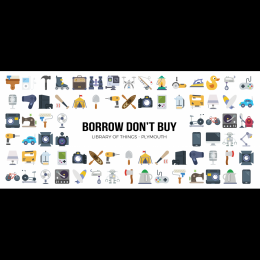 We are a small team of volunteers running Borrow Don’t Buy – Plymouth’s First Library of Things. A Library of Things is a place where you can borrow stuff we need to use, and not necessarily need to own. We help our members save money, reduce clutter, reduce our carbon footprint and waste, but the best thing is that while doing this we strengthen and connect our community. We would love to get everyone involved! If you are a fixer or just enjoy these projects, please get in contact with us and join us in making Plymouth more Awesome!